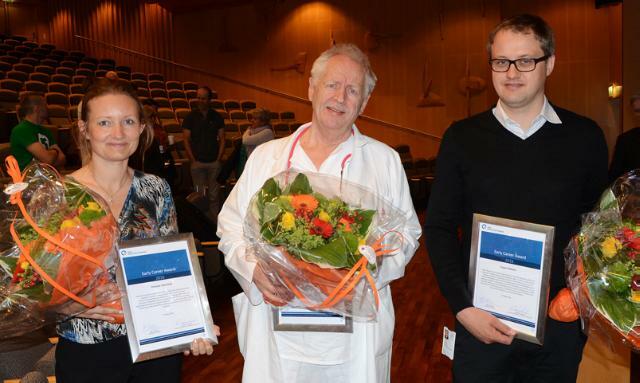 Three scientists received awards for their outstanding research activities at a ceremony taking place at Oslo University Hospital May 27th. The major prize - the "Excellent Researcher Award" - went to professor Pål Aukrust. Therese Seierstad and Espen Melum both received the "Early Career Award". Pål Aukrust is a true academician who has reached excellence clinically and scientifically. He is a fine teacher and has as a mentor been responsible for more than 25 PhD students. He has established competent research groups within the dynamic scientific field of inflammation and immunological mechanisms in cardiovascular diseases. Pål Aukrust has also important scientific contributions in the fields of DNA repair and Oxidative stress. He is a dynamic leader with a capacity to lift others. senior scientist at the Research Institute of Internal Medicine (RIIM) and the Norwegian PSC Research Center (primary sclerosing cholangitis). Espen Melum has already at the start of his medical education shown an interest in medical sciences and academia. After his PhD, in 2010, at The Faculty of Medicine, University of Oslo, he spent almost two years in Richard Blumbergs laboratory at Harvard Medical School/Brigham and Women´s Hospital. A time well used with high profile publications. He is a scientific leader and has established his own research group which is well funded from external resources. In addition to his research activities he is also well on his way to a clinical specialization. Therese Seierstad completed her PhD in 2008 in the field of functional magnetic resonance imaging related to colorectal cancer. Therese Seierstad has also carried out interesting comparisons of functional imaging techniques such as MRI and PET. She has been organizing and designing several clinical trials and the focus of her clinical research has been detection, prediction and follow-up of treatment responses.